The Invader is a mixer with a built-in computer. 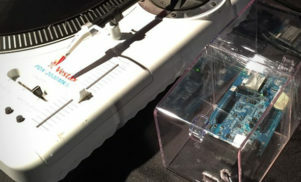 DJ QBert has shown off the Invader, a mixer with a built-in computer that the turntablist hopes will put an end to selectors and scratch artists having to bring laptops to gigs. 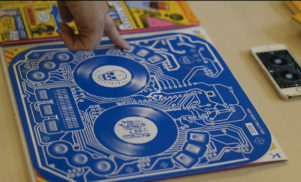 Designed by QBert and fellow turntablist Yogafrog’s Thud Rumble company, Invader was shown in a very basic prototype form last year. A more complete version has now been shown at the Intel Developers Forum, and is expected to launch later in 2016. As Engadget reports, the Invader is a two-channel mixer with a built-in touchscreen. It was shown running Native Instruments’ Traktor software, but it’s capable of running any Windows 10-compatible DJ app. Invader features eight buttons on each channel that control cue points in a track. It also includes all the usual audio inputs including phono for connecting to turntables, three USB ports and an HDMI connection for video. Rather than just offering off-the-shelf models of the Invader, Thud Rumble is also giving buyers the option to customise their mixer with laser-etching, different colours and a choice of rubber or “old-school” arcade buttons. According to Thud Rumble, the Invader should ship by the end of 2016. It’s expected to cost $1,699, which is comparable to other mixers that don’t have a computer inside.